Ryan Zinke is a former state senator for Montana who served as the Secretary of the Interior. He previously served in the United States House of Representatives from 2015 through 2017. In addition, he served as a Navy SEAL for over 23 years, including some time on Special Warfare Development Group. He resigned as Interior Secretary on January 2, 2019. ↑ Cama, Timothy (January 2, 2019). 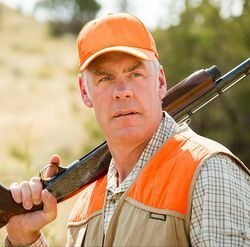 Zinke departs from Interior post. The Hill. Retrieved January 2, 2019. This page was last modified on 2 January 2019, at 20:24.